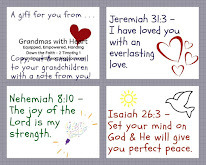 Grandmas with Heart is here to equip, empower, encourage & engage grandmas (and grandpas & parents, too) to hand down a heritage of faith to the children they love. One of the primary focuses of our prayers for our children and grandchildren is for them to make the choice to believe in and follow Jesus. 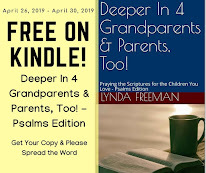 When they do, while the Bible says there is rejoicing among the angels in Heaven, I am convinced a grandma (and grandpa, too) certainly rejoices just as much, if not more than the angels! We rejoice, greatly, but our prayers do not end. They just change in focus. The ones we love are going to face challenges and difficult times in their lives. They will need to make all kinds of choices - some, they will choose wisely, some they will not. 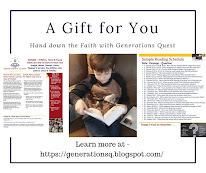 Certainly the evil one wants them to stumble and fall away, but we know Jesus has promised no one, not any one, is able to take His sheep out of His hand or the hand of His Father. The truth is they are secure in His love and care; whether they feel like it or not. So, pray for them to make wise choices and pray for them to know, believe and hold tightly to the truth of how their stumbles do not mean they no longer are loved by God. Share this truth with them; it matters. And, remind yourself of it as well. 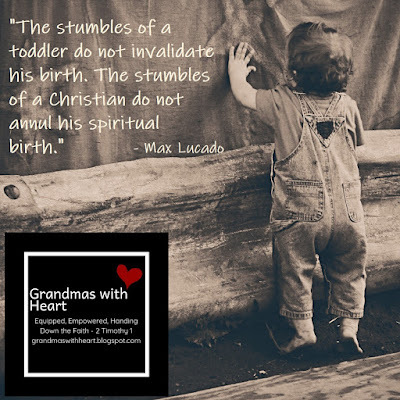 Just because we are the grandma (or grandpa) it does not mean we won't stumble. When you do, remember, believe and hold tightly to the truth of how your stumbles do not mean you are no longer loved by God. 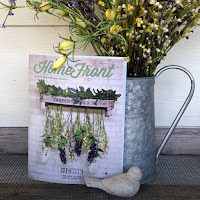 Welcome to "Grandmas with Heart"! 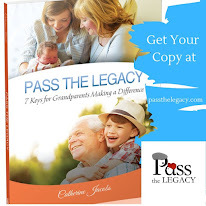 What Do I Need to Know When Grandparents Assume Responsibility for Their Grandchildren? 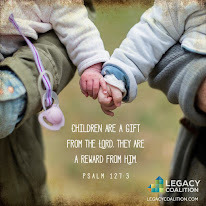 God cares for the single parent and will provide for you and your children. Let this book give you the tools you need as you walk with Him in this journey. 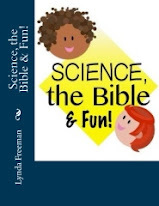 This is a wonderful tool for you and/or your single adult children. 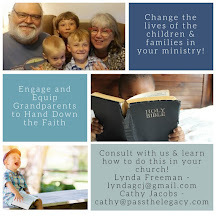 Learn how to make a real and lasting difference in the lives of your grandchildren. 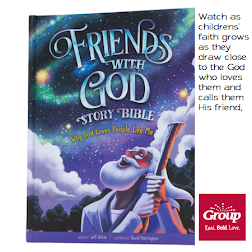 Help Children Build a True Friendship with God! 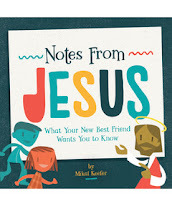 Hear from Jesus how to know Him better!